The Model block allows you to include a model as a block in another model. 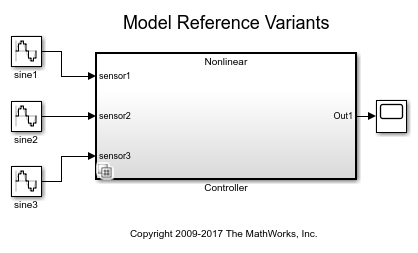 The included model is called a referenced model, and the model containing it (using the Model block) is called the parent model. The Model block displays input and output ports corresponding to the top-level input and output ports of the referenced model. Using these ports allow you to connect the referenced model to other blocks in the parent model. See Model References for more information. By default, the contents of a referenced model are user-visible by double-clicking the Model block. 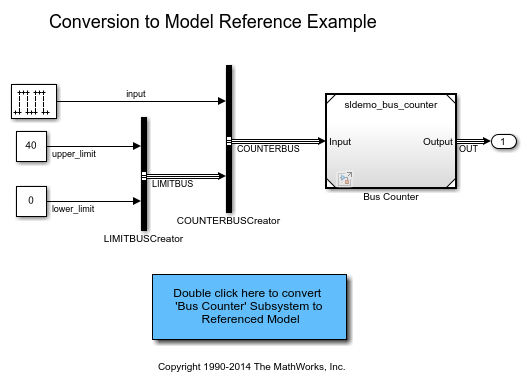 However, you can hide the contents of a referenced model by making the model a protected model. To set the referenced model and simulation parameters, open the Block Parameters dialog box and use the Main tab. To specify values for model arguments, use the Arguments tab. The Model block has an input port for each root-level Inport, Enable, or Trigger block in the referenced model. The name of the Model block port matches the name of the corresponding referenced model input block. The Model block input signals must be valid for the corresponding referenced model input blocks. See Model Reference Interface. Input signals can have real or complex values of any data type supported by Simulink, including bus objects, arrays of buses, fixed-point, and enumerated data types. For details about data types, see Data Types Supported by Simulink. The Model block has an output port for each root-level Outport block in the referenced model. The name of the Model block port matches the name of the corresponding Outport block. The Model block output signals are the signals from the corresponding referenced model Outport blocks. See Model Reference Interface. Output signals can have real or complex values of any data type supported by Simulink, including bus objects, arrays of buses, fixed-point, and enumerated data types. For details about data types, see Data Types Supported by Simulink. Path to the referenced model. The file name must be a valid MATLAB® identifier. The extension, for example, .slx, is optional. The file name must contain fewer than 60 characters, exclusive of the .slx or .mdl suffix. To navigate to the model that you want to reference, click Browse. To view the model that you specified, click Open Model. Specify the simulation mode for the Model block. 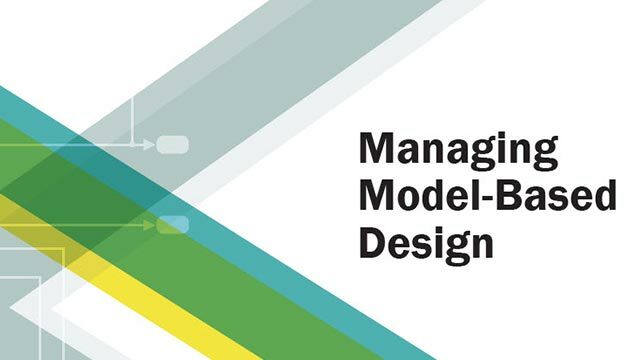 The simulation mode for the Model block can be different than the simulation mode of its referenced model and of other models in the model hierarchy. Accelerator — Create a MEX-file for the referenced model and then executes the referenced model by running the S-function. Normal — Execute the referenced model interpretively, as if the referenced model is an atomic subsystem implemented directly within the parent model. Software-in-the-loop (SIL) — This option requires the Embedded Coder® software. Generate production code based on the Code Interface parameter setting. The code is compiled for, and executed on, the host platform. Processor-in-the-loop (PIL) — This option requires the Embedded Coder software. Generate production code based on the Code Interface parameter setting. This code is compiled for, and executed on, the target platform. A documented target connectivity API supports exchange of data between the host and target at each time step during the PIL simulation. The corners of the Model block reflect the simulation mode of the Model block. For normal mode, the corners have empty triangles. For accelerator mode, the corner triangles are filled in. For SIL and PIL modes, the corners are filled in and the word (SIL) or (PIL) appears on the block icon. While you can set a referenced model to rapid accelerator mode, simulation ignores the referenced model simulation mode. For information about simulation mode precedence in a model hierarchy, see Simulate Model Hierarchies. Specify whether to generate the code from the top model or the referenced model for SIL and PIL simulation modes. To deploy the generated code as part of a larger application that uses the referenced model, specify Model reference. To deploy the generated code as a standalone application, specify Top model. Code generated from referenced model as part of a model hierarchy. Code generation uses the slbuild('model', 'ModelReferenceCoderTarget') command. Code generated from top model with the standalone code interface. Code generation uses the slbuild('model') command. To display and enable this parameter, select either Software-in-the-loop (SIL) or Processor-in-the-loop (SIL) from the Simulation mode drop-down list. Control display of initialize event port on the Model block. Display model initialize event port. Control display of reset event ports on the Model block. Display model reset event ports. Control display of terminate event port on Model block. Control display of periodic event ports on Model block. Display ports for rate-based models. A rate-based model is a model with the Sample time for a connected Inport block specified. If you want to manually specify the port rates, set the parameter AutoFillPortDiscreteRates to 'off', and then add the port rates to the parameter PortDiscreteRates. Display ports for rate based models. Create partitions for rate based models. Display instance parameters and specify instance-specific values. Instance parameters are block parameters that have been configured in the referenced model to use a different value for each instance of the model. To specify instance-specific values, use the Value column in the table. To specify that a parameter value can be overridden by the parent model, select the Argument check box. 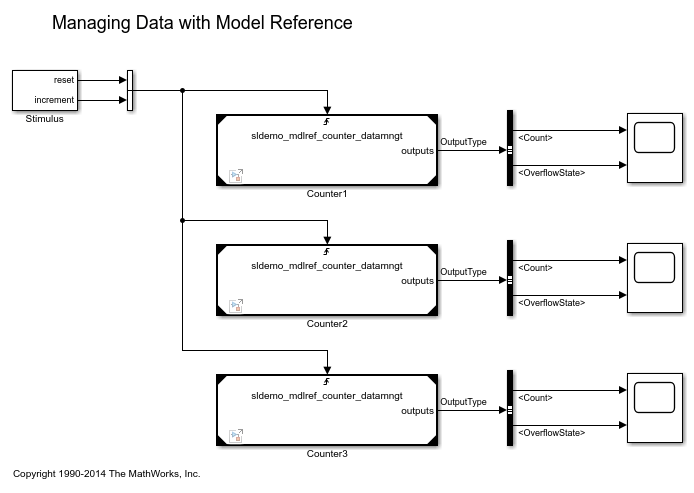 For more information about configuring instance parameters in a referenced model and specifying instance-specific values at the Model block, see Parameterize Instances of a Reusable Referenced Model. When changing instance-specific values, you can use a partial structure, which has fields that correspond to only the instance-parameters whose values you want to change. Instance parameters not included in the partial structure retain their values. In the structure, include the instance parameter names and values, represented as character vectors. Value: structure with fields: Name, Value, Path, and Argument. Starting in R2019a, specifying variant models in Model blocks is no longer supported. The Model Variants block, which was a Model block preconfigured to specify variant models, is also no longer supported. Loading a model that contains these blocks converts them to Variant Subsystem blocks that contain Model blocks that represent the variant choices. The Variant Subsystem block parameter Analyze all choices during update diagram and generate preprocessor conditionals behaves differently from the Model block parameter Generate preprocessor conditionals. Instead of causing simulation and update diagram to compile the active variant only, the Variant Subsystem block parameter compiles all variants. If you have scripts that use Model block parameters for variants, you must update them to use Variant Subsystem block parameters. For more information about HDL code generation, see Model.